On January 10, 2017, State Farm® Insurance Agent, Tony Adams and Licking County Foundation Donor Services Officer, Megan Evans presented 180 smoke and 18 carbon monoxide detectors to the chiefs of Licking County’s fire departments to help hundreds of area families be safer in their homes this winter with these early-warning and life-saving alarms. For the last nine years, the State Farm® Fire Safety Fund of the Licking County Foundation has granted a total of $41,768 to provide 4,192 smoke and 1,098 carbon monoxide detectors to local fire departments for distribution to families in need. "As a part of this community for more than 50 years, State Farm® is committed to Licking County and to helping local families protect themselves from the dangers of a home fire. We are honored to partner with our local fire departments to get smoke and carbon monoxide detectors into more homes. Through this effort, we hope to help protect Licking County families for many generations to come,” said Tony Adams, State Farm® Insurance Agent. “The Licking County Foundation continues to be very grateful to State Farm® for their partnership and care for our community, and for their invaluable support of Licking County’s fire departments who work tirelessly to keep all of us safe from fires,” stated the Foundation’s Donor Services Officer, Megan Evans. For more information about the State Farm® Fire Safety Fund donation program or to learn more about establishing a charitable fund at Licking County Foundation, please contact Connie Hawk at 740.349.3863, x105 or connie@thelcfoundation.org. 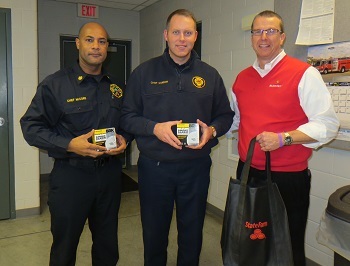 Photo: On behalf of all fire departments in Licking County, City of Heath Fire Chief Warren McCord and City of Newark Fire Chief Patrick Connor accept a donation of smoke and carbon monoxide detectors from State Farm® Insurance Agent, Tony Adams. Farsighted civic leader Everett D. Reese had a vision of ensuring that the quality of life in Licking County would continually improve. To do this, he initiated the effort to establish a public community foundation for Licking County. Mr. Reese was a rare individual whose life and achievements were based on his belief in helping others. On November 21, 1956, the Licking County Foundation’s declaration of trust was drafted and filed by J. Gilbert Reese, Mr. Reese’s son. The original Governing Committee members included Everett D. Reese, Harold L. Ballinger, Francis P. Kennedy, Robert H. Flory, Games Slayter and Howard LeFevre. Since that time, the Licking County Foundation has grown to $82.2 million in assets through generations of gifts made by caring donors; and has changed the lives of countless people through $44.4 million in grants and scholarships to dedicated nonprofits and deserving students. Over the last 60 years, Licking County’s continuous generosity has ensured that Everett D. Reese’s philanthropic legacy of advancing our community will continue far into the future. For information, please call 740.349.3863 or visit www.thelcfoundation.org.